By: Bill Leedham, P.Geo, QP, CESA. Last month I discussed some common mistakes I have encountered in reviewing Phase Two Environmental Site Assessment reports, specifically in the initial planning stage, now it’s time to turn our attention to recognizing and reducing errors during the Phase Two ESA field work. Sometimes, deficiencies that occur in the planning stages of a Phase Two ESA transfer into errors in field procedures. This can be caused by poor communication between the project manager and field staff (i.e. the PM neglects to inform field personnel of specific project requirements, and/or field staff forget to include important sampling media or potential contaminants of concern). Full, two-way communication is vital to successful completion of any Phase Two ESA. It’s not enough for senior staff to just assume that less experienced team members understand all the complexities of the sampling plan; nor is it acceptable for a project manager to fail to provide adequate guidance and answers to questions from the field. I have always thought it was important for junior staff to ‘know what they don’t know’ and encouraged them to ask questions at any time. When project managers are ‘too busy’ to answer questions and simply tell their staff to ‘figure it out themselves’ everyone loses. Despite good intentions and full communication, deficiencies can still occur. Some are the result of inexperience compounded by poor judgement; some are due to budget limitations or staffing shortfalls; and some are caused through poor sampling protocols. Some of the more common field sampling errors can include: failure to sample all relevant media at a Site (e.g. no sediment or surface water sampling is undertaken despite the presence of a potentially impacted water body); failure to consider all potential contaminants of concern (e.g. sampling only for petroleum hydrocarbons at a fuel storage site and not volatile parameters like BTEX); failure to sample in locations where contaminants are most likely to occur or be detected (e.g. 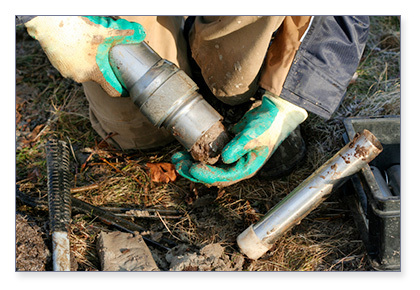 sampling only surficial or near surface soils, and not at the invert of a buried fuel tank or oil interceptor, or failure to sample groundwater in a potable groundwater situation); and lack of field or lab filtering of groundwater samples for metals analysis (failure to remove sediment prior to sample preservation can skew the results for metals analysis). Inadequate sampling and decontamination procedures can also bias lab results, leading to inaccurate or faulty conclusions. When samples are disturbed (such as grab samples of soil collected directly from a drill augur that has travelled through an impacted zone) or collected improperly (e.g. compositing soil samples for analysis of volatile components); the test results can be biased and may not be representative of actual site conditions. Similarly, failure to properly clean drilling and sampling equipment can result in apparent impacts that are actually the result of cross contamination between sampling points. Consider using dedicated or disposable sampling equipment to reduce this potential. A suitable quality control program should also be implemented, including sufficient duplicate samples, trip blanks, etc. for QA/QC purposes, and inclusion of equipment rinsate blanks to confirm adequate decontamination. These are only a few of the more common field sampling errors I have come across. In an upcoming article I will discuss other practical methods to reduce errors in Phase Two data interpretation and reporting. This article first appeared in AESAC newsletter. The GeoProfessional Business Association (GBA) – formerly known as ASFE – recently released a new study on the standard of care for conducting Phase I environmental site assessments. This document is the fourth in a series of studies the organization has produced since the inception of the due diligence process in the early 1990’s. The study is an evaluation of approximately 200 Phase I reports from across the country, written between 2007 and 2010. The results of the study will be a valuable tool in determining whether a Phase I conducted during that time period meets the standard of care or not. 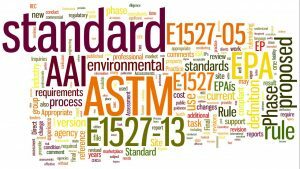 In completing the study, the GBA compared the Phase I reports to the elements of the ASTM Standard E1527-05, applicable during the time period of the reports, to see whether the reports included the elements of the ASTM standard. Although nearly all of the reports stated they were completed in accordance with the ASTM Standard, the committee reviewing the reports concluded that not a single report actually complied with every component required by the Standard. Consequently, the GBA study finds that strict compliance with the ASTM standard does not constitute the standard of care for conducting Phase I evaluations of commercial real estate. The committee’s conclusion could become critical in legal actions where the issue at hand is whether appropriate environmental studies were completed prior to completion of the transaction. The GBA study could be used to show a court that because strict compliance with the ASTM Standard is not commensurate with the standard of care, a purchaser could still be in compliance with the All Appropriate Inquiry provisions of CERCLA even if some of the elements of the ASTM Standard had not been completed. The study is available through the GeoProfessional Business Association at www.geoprofessional.org. This article was first published on the Troutman Sanders website. Jerrold “Jerry” Samford is an environmental compliance specialist at Troutman Sanders. He is a certified professional geologist in the State of Virginia, a licensed professional geologist in the States of North Carolina and Kentucky. Andrea L. Rimer is a partner at Troutman Sanders. She has a national practice representing clients on transactional and regulatory matters involving brownfields redevelopment, hazardous site investigation and cleanup, hazardous waste management, and state and federal Superfund and voluntary remediation programs.